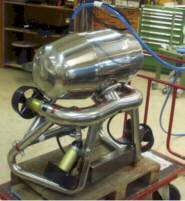 ABB TRC is completing the design and manufacturing of a new manipulator concept for nozzle inspection in BWR´s. 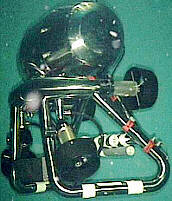 The manipulator consists of a free-swimming underwater remote operated vehicle (ROV) carrying a scanner for use on nozzles above the top guide. At the test site, the Goldfish is manually launched and is maneuvered to the nozzle. There it is centered and locked to the inner diameter by centering mechanisms, specially adapted for each type of nozzle. Different types of end effectors can be mounted, for example UT- and ET-configurations for inner radius, inner surface, nozzle to pipe weld and nozzle to shell weld. Goldfish can also be used with high magnification visual testing equipment and for EDM. Goldfish reaches 1.5 meters into the nozzle, and has a total length of 2 meters. The Goldfish manipulator is being designed, manufactured, tested and qualified under a very short period, less than one year. The system is therefore made as simple as possible with a stable neutral buoyancy vehicle with four thrusters giving four degrees of freedom. 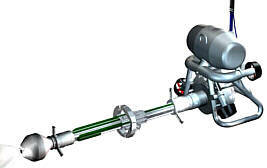 The manipulator is centered and clamped to the nozzle inner bore with the reactor vessel wall as reference, which removes the need for an external positioning system. The scanning devices are customized for each different area of inspection by means of a module system. 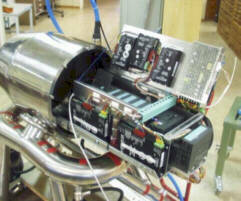 ABB TRC completed conceptual design in November 1999 and detailing is in its finish in April. Manufacturing begun in January 2000 and the first tests have taken place in April 2000. The Goldfish ROV Manipulator will be qualified in September and the first sharp inspection is planned for the beginning of 2001. In 1997 BKAB and OKG initiated a project with purpose to do qualified on site inspections of the BWR vessels at Barsebäck 1 & 2 and Oskarshamn 2. The 30:th of July 1999 ABB TRC were contracted for a major part of the project. Project Goldfish was started to fulfil the demands in the inspection project. Though ABB TRC AB already had well proven equipment for the reactor inner surface and the penetrations but with the disadvantage that they could not operate at the same time, a new flexible penetration inspection system was needed. With knowledge of what was accessible on the market we found that the best alternative was to develop a new system specially made for the Swedish and Finnish markets. We made a value analysis and compared three different alternatives. Fig 1a: "Longlegs" Maneuvered with rigid lifting poles from the service bridge. Fig 1b: "Goldfish" a combination of a ROV and a fixed rotation unit with interchangeable end effectors Fig 1c: "Swordfish" a combination of a ROV and an inspection manipulator, with a mechanized adaptation movement. Our choice was to go on with the alternative "Goldfish". This concept is not completely new but we saw the advantages with a small flexible equipment independent of the reactor main hoist or the service bridge. The Goldfish flies down to the penetration and will not reach out over the core region when it is adapted to the penetration, which will allow parallel work inside the reactor vessel. Our goal for this new system was that it would fit all the "larger nozzles" in Swedish and Finnish BWRs. Which means that the following data is required. Nozzle inner diameter f(mm)	 The inspection area, positions from vessel inner surface (mm). Radius for the inspection area on the reactor inner surface. From nozzle centre (mm). 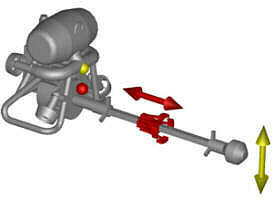 The most important feature and function are the centering in the nozzle bore. 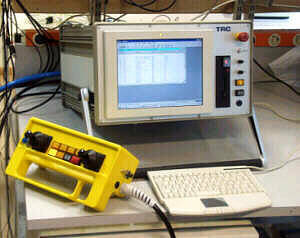 The inspection device will automatically position in line with the nozzle centre and will be independent of misalignments of the penetration itself. 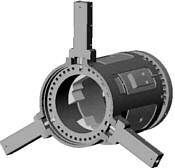 The mechanical reference against the reactor vessel inner surface will secure an exact positioning. 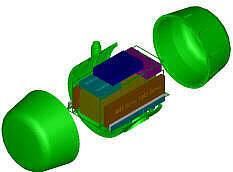 A modular concept with end effectors specially adapted for each component and scanning area. There is no need for an advanced submarine with complicated electronics etc just a stable neutral buoyancy platform for the end effectors to transport them down to the penetrations. All communication and electrical power to the equipment is supplied through a few wire system. 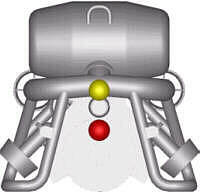 The different end effectors have neutral buoyancy themselves to make the changes quick and easy. The mechanical design had to be "open" for late decisions regarding the length of travel, linear strokes, which now provides the possibility to build new end effectors with any linear stroke without changing the design. 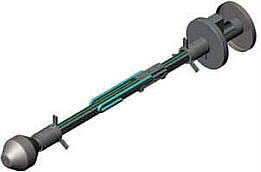 The center mechanism is designed to give a fast, repeatable and reliable centering in the nozzle. It is designed to pass through the smallest penetration, with a diameter of 138 mm, and expand out to the biggest nozzle, which gives a radius difference of 200 mm. Goldfish do not block the core region during scanning. Only two persons will operate the systems all functions. That includes launch into the reactor, manoeuvring and data acquisition. This also means that the system is in no need of bridge or crane support. The system is prepared for a future high magnifying video testing equipment. 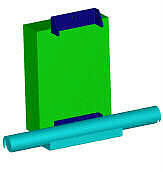 Fig 4: End effector for nozzle to pipe weld, to be inserted in the rotation unit described below. The centering devices are mounted on each side of the inspection area and the linear carriage where the probes are to be mounted. This gives a perfect alignment along the nozzle bore. Fig 5: End effector for inner radius and nozzle to vessel weld. 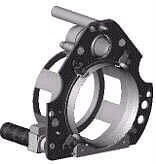 This picture shows the centering devices placed at the front. This gives room for the linear carriage to move the probes for the inner radius and the arm for the nozzle to shell weld. 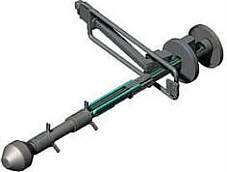 This will give an alignment to the nozzle with a shorter but fully sufficient base. Fig 10: This figure shovs the Goldfish neutral buoyancy with the passive stability which is given by the distance between the center of buoyancy and center of gravity. The distance should be as long as possible for a stabile system. 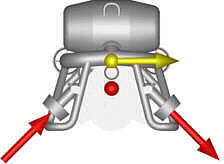 Fig 11: This picture shows the lateral translation, which is made possible by directing the "vertical" thrusters through the center of buoyancy Fig 12: The inclination is controlled by moving the linear scaner back and forth or by pumping trim water into the front cone. Fig 14: This picture shows "GOLDFISH" on its first swim in ABB TRCs test pool. (April 12, 2000). 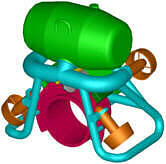 Fig 13: The "GOLDFISH" in a feed water nozzle, (from CAD model). Fig 16: This panel is used for the controls and includes PC and a PLC for few wire comunication and the power supply. The box also includes video card for the surveillance cameras and light controls. The images can be presented on this screen or a separate monitor to give a better resolution Fig 17: Goldfish at TRC´s workshop in April 2000. Surveillance cameras	 Color zoom autofocus camera in submarine body. Monochrome fixed focus at the front cone.